At Tate Morden, I found a series of images about cells and the universe. The shape and texture of each pattern are very beautiful. This may be related to my personal project, which I am going to do in shuttle of space. I have seen many graphic designers’ works, like David Carson, Young Chen Nieh and Stefan Sagmeister. I am interested in David Carson especially because I like his typography, and he widely used the combination of different typefaces and photography to give people a strong visual impact. In level 3, I have a certain understanding of how to complete a project. First, I hope that my professional level is getting better and better. Then I want to make my ideas, content conveyed more active, and the form of outcom can be diversified. In level 3, I think the most interesting thing I have learned is screen printing. I have used screen printing in two projects. It can match different colors and materials. The whole process was fun. Two other things are the improvement of self-learning ability and time management. Graphic design is everywhere in the life, this majors cover a wide range of subjects, such as packaging, posters, typography, advertisements and so on. And I think graphic design is what use a visual way to convey a project information. The most successful of my works is… As for the second project, for the magazine design of a restaurant, I observed the decoration style and dish characteristics of the restaurant, which determined the design elements of the magazine. For example, the design concept of some shapes in the magazine comes from the wood Chinese style carvings in this restaurant. If it can be improved, I think magazine binding or deal with photoes can be more professional. My third project was a bit difficult I think, I didn’t know what to do for a while, I was confused at that time. Because I have many points to develop, I like them very much, and want to combine them, but I do not know how to start, how to visualize. So I will focus more on one idea in the future. I think I have a basic concept of graphic design, so I want to further improve my professional and technical skills through undergraduate courses definitely. I have a good foundation for painting, I am willing to record what I see in a painting way. Then I will further study from different perspectives,such as the meaning of an object in different countries. And I am good at using software, like Photoshop, Illustrator. The last book I read was about Julian opie. It is mainly famous for its unique characters and portrait paintings. 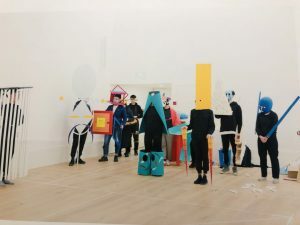 I was impressed by his minimalist set of characters in 2018, called Walking in Melbourne. Also, He was good at drawing human body outlines with thick black lines. My outcom is a folding book made with digital. 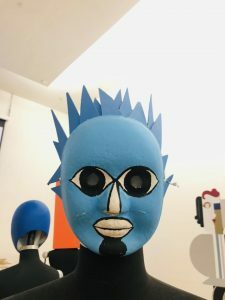 In fact, for a while afterwards I was confused because I changed my mind and wanted to combine human face and drama masks, After various attempts, it is difficult to combine Chinese masks which is already perfect. 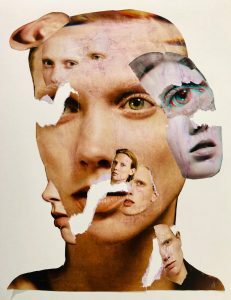 The idea is to reflect the personality behind the face, but different shapes and colours of the face have different meanings, so it is difficult to show the combination and how to visualize. 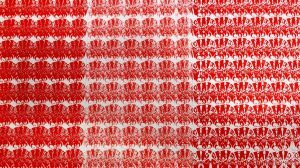 After that, I insisted on the original idea, using the pattern made by screen printing to combine with the shape of human body in the exhibition, which is based on the prototype of Chinese drama. Then I saw a movie called Farewell My Concubine. It’s a really famous film in China and it is a sad story. This movie is about two men, one of them was taught to be a woman and to sing opera when he was young, so he trained with his elder brother, who depended on him. When he grew up, he became the protagonist. In fact, he was a homosexual. The sad thing is he has fallen in love with his elder brother and said that he would sing drama all his life. But his elder brother betrayed him, married his wife and gave up singing. He was in great pain and finally pulled out his brother’s sword and killed himself. So the background of my work is the scene where the two protagonists last meet, and use blue tones to highlight the sadness of the story. Moreover, I drew the plots in a simplified way. If I have more time, I think it would be fun to try making all kinds of faces in a 3D model. In the process of creation, I have many points to develop. However, there are many things I did, so I am confused about which one is better to develop. 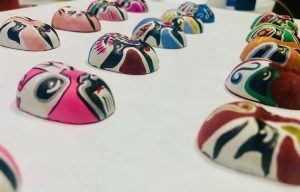 The fist step is to investigate the collected drama masks, which is divided into different personalities according to the colour, such as red is loyal and reliable. 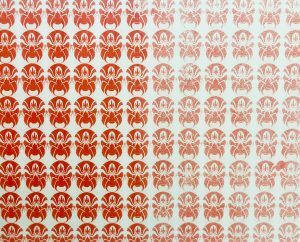 Then it took a week to make screen printing with masks. I used different colours and colour cardboard printing, mainly choose red and black. Among them, I separated the parts of one masks and combined only one part with another. The overlapping of the same part of masks, I think it’s fun. Moreover, I used Illustrator to design the key parts of drama masks and to be patterns. Because different colours have different personalities, just like people’s personalities, so I have an idea of combining drama masks with people. 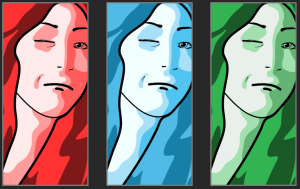 When I developed this idea, I use colour to distinguish them but was stumped by the combination of human faces and drama masks. Ultimately, it was decided to further develop it in the form of pattern initially. 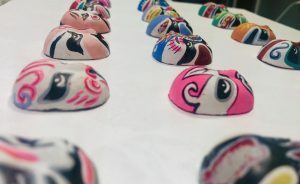 I collected Chinese drama masks, made of clay. I want to collect masks for two reasons. One is that drama masks are the quintessence of China. It has a wide range of categories, different colors or different names in different parts of China. Another reason is that I watched an exhibition about Bauhaus Figural Space during the winter vacation. The prototype of this exhibition is about Chinese drama. 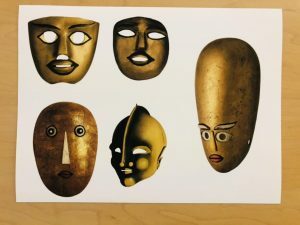 These masks were found in some ancient towns or streets in China. The masks means painted on the face, which I find interesting. 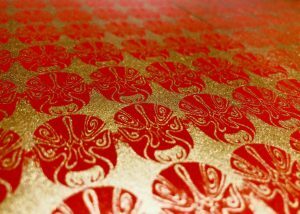 Then I did a lot of research on different kinds of masks and screen printing with representative red masks. I think this part will be used later. Wu Rujun was born in China in 1963 and is currently the president of the Japanese Peking Opera Theatre. He is an active male performer on the stage. He is proficient in everything from performance to creation. 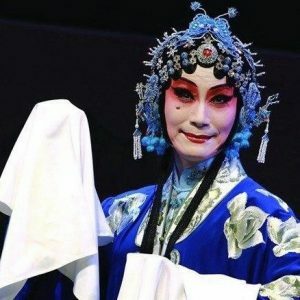 He has written, directed and acted in such Peking Opera dramas as ‘Wu Zetian’ and ‘Guifei Dongdu’. Wu Rujun created the Beijing Hu light music performance method, and then created the Beijing Hu Symphony ensemble, which is refreshing. And the beautiful artistic conception of the Golden Golden Horse, thus opening up a wide space for the performance of Beijing Hu. Wu Xuanjun won the reputation of ‘Beijing Hu wizards’ for himself. 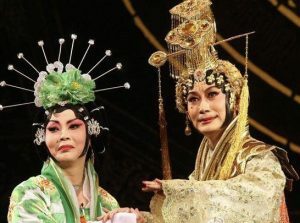 Yan Shaokui and Cheng Shaoyan are two representative figures of Peking Opera Face Art. They are both fond of Chinese Peking Opera Face Art. 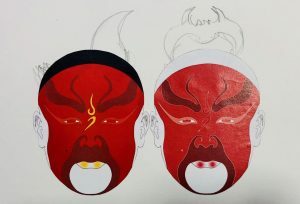 In the long-term research and creation, they have formed their own styles and created Peking Opera Face Art with different characteristics. 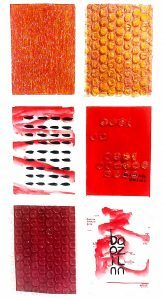 From face makeup to clay face painting, and then to glass fiber reinforced plastics, Xuan Paper and other paintings, it has become a decorative work of art. Its works inherit the traditional Chinese face painting techniques, smooth lines, brilliant colors, deformation, exaggeration and a combination of various techniques, become a Chinese nationalized works of art. Cheng Shaoyan’s handmade Xuan Paper is different from other craft facial makeup. It is a new innovation based on inheriting traditional craft facial makeup, and at the same time, it uses the skill of accurate sketch of stage professional spectrum to give it its unique charm. During the winter vacation, I collected three groups of works about dramatic figures and expressed them in different ways. The first collection is in the form of photography. I saw an exhibition during the winter vacation. The name of the exhibition is called Baohaus Figural Space Educational Exhibition. It is include the Song Zaju figures, prospect music instruments, etc. I photographed all the figures in the exhibition and recorded a video about the music. Song Zaju refers to all kinds of songs and dances, Zaju and drama in Song Dynasty. The form of opera should be a combination of singing, reading, acting and playing, in order to represent the whole story. The Zaju color of the court in Song Dynasty is the direct source of the pure and ugly character of the opera, and the system of the role of the opera is the core of the performance system of the opera. 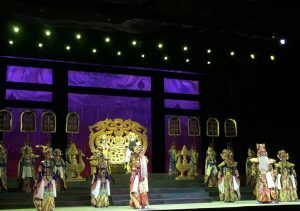 The performance of imperial Song Zaju is the embryonic stage of the ‘original formation’ of Chinese opera, which has irreplaceable uniqueness. I was very interested in this kind of drama and went to find stores for collections related to ancient drama. Most of these shops are located in remote, old or tourist attractions. I saw a shop selling clay products in a small corner. It was full of Chinese troditional things. I found some beautiful and delicate clay opera faces, and I decided to collect them. Also, I made several faces with the shopkeeper in the shop. It was a wonderful process. The third collection is about drama drawing. 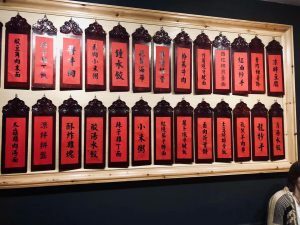 In Baohaos Figural Space Exhibition, it produced five figures of Song Zaju: ‘Moni’, ‘Yinxi’, ‘Fujing’, ‘Fumo’, and ‘Zhuanggu’. 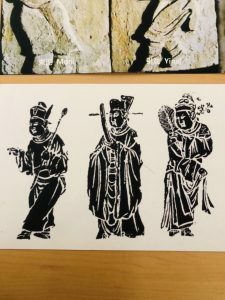 These are the classic dramatic figures of the Song Dynasty drama. I drew dramatic figures from different times and places. I paint with watercolour and the drawing basically used three primary colours. The connection of these three collections are sharing the same thing about drama, and these are colletions of figures. My second project is also related to the Chinese style. I want to express something about the traditions of my country. And then there may be points of connection with British culture. In this half year at LCC, I decided to choice graphic design for my pathway. Graphic design is widely integrated into our life. Whether it is product packaging, brand identities or publications, all use design as an expression of communication to convey ideas. When I see beautiful things, I am very excited and have the impulse to buy. For example, I can buy something because it has interesting typesetting, beautiful packaging, a strong identity, imaginative concept, cover design or visual effect. My first project was a poster about letter D, D for Dance. Inspired by a movie about ballet and I drew a lot of ballet shoes. When people stand on tiptoe, jump, spin, show their dance charm, they will enjoy the pleasure. I want to express a simple but important meaning of this project. Everyone has something shining on the stage, showing his heart bravely and enjoying the happiness. I’ve done the workshop inductions at LCC, and I know how to do letterpress and screen printing.So I used screen printing for my first project, I used diverse colour and different kinds of papers to do get more experience. I found that the colour printed a little lighter than the actual colour, and I felt it a little difficult to control. But I can use this workshop skilfully now, and I will use this technique in the future. The second project is a magazine about postcode. 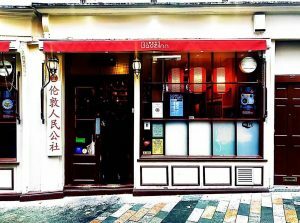 In my postcode Chiantown, I found a chinese restaurant called Baozilnn, and the chinese name is ‘Ren Ming Gong She.’ This Sichuan restaurant set off a ‘ spicy storm’ in Chiantown in 2013. And the restaurant has a very authentic Chinese style in both food and decoration, so I chose this restaurant. The contents of the magazine include the history, decoration style and food for the Sichuan restaurant. I can use some softwares such as Photoshop, Illustrator and InDesign; these applications help me a lot with my works. For my second project, I use InDesign to make magazines, and typeset. And my best software is using Photoshop to process pictures and drawing. Also, This magazine’s design I planarize it, observe and research the elements of restaurant furnishings, deco,etc. Then abstract them with lines, geometric patterns, and finally form a plane effect. Also, the greater achievement in foudation course is to learn to study independently. In my spare time, I stay in the library and read books. This allows me to see the design styles of different years and to understand graphic design by observing designer’s works, such as how to choose typefaces. It gave me a lot of design knowledge, and I have developed my ability to self-study and to do secondary research. In conclusion, I have learned a lot in this course. 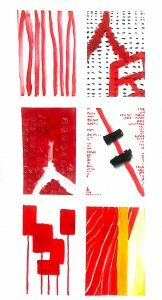 What I am most interested in is screen printing, which involves my pathway (graphic design), it is an interesting way of printing. In the second half of the semester, I hope I can make more progress in the field of graphic design and create more ideas. I went to a very popular exhibition in Hangzhou during the winter vacation. 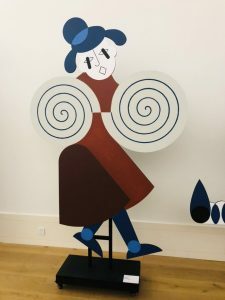 The name of this exhibition is ‘Bauhaus Figural Space’, and it is about Song Zaju (dramatic figures in the Song Dynasty). 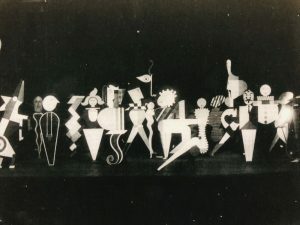 From 1923 to 1927, Oskar Schlemmer developed his ‘The Figural Cabinet’ together with his brother Carl Schlemmer and students of the Bauhaus Stage. 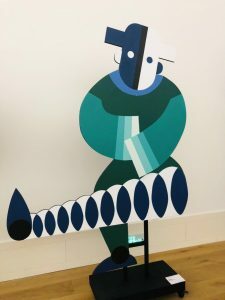 The flat figures of this cabinet are constructions in which Schlemmer reinterpreted as constant topoi of the human body schema in open, incomplete and ambiguous structures. 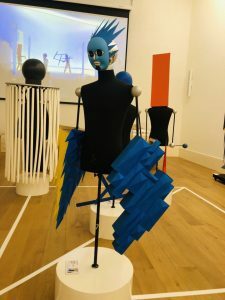 This resulted in antitheses and playful distortions of the human body patterns, readable as statements about a disorientated body-feeling of the modern human being or a fusion of human being and mechanical figure. Also, the prototype of these figures is based on the classical dramatic figures of the Song Dynasty in China. In the setting of the characters, it referred to the system of five basic persons in Song Zaju, which are Moni, Yinxi, Fujin, Fumo, Zhuanggu. 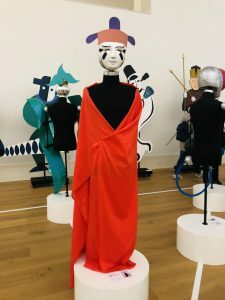 ‘Moni’ was the leader of the Zaju performance, who was responsible for arranging and control the whole performance, while entering the stage to read the poetry and sing. ‘Yinxi’ derived from the dancer of the Grand Music in the palace of Tang Dynasty, who firstly entered the stage to dance, and then lead others. ‘Fujin’ used ink and powder to paint the face, whose speciality was pretending to be silly. ‘ Fumo’ was putting on the face white, who was in charge of the work of buffoonery in the Zaju performance. ‘Fumo’ and ‘Fujin’ constituted a pair of comical actors with cooperation to build the comical scene together. ‘Zhuanggu’ was acted as an officer, who was not a perfect character, only playing a part when an officer came on the stage. In addition, the band also was an important part of the Zaju Performance. 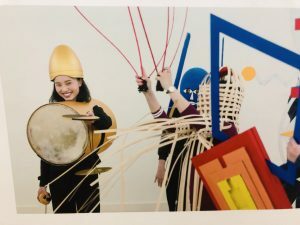 In the features of the characters, it brought in the four patterns which were put forward by Schlemmer as references, ‘Moni’, ‘Yinxi’, ‘Fujin’ and ‘Fumo’, ‘ Zhuanggu’ are respectively corresponding to ‘dematerialization’, the marionette’, ‘a technical organism ambulant architecture’, while the design of the clothing and behavior use the reference to the four paradigms in a certain extent. Bauhaus and Song Zaju traditions were integrated to create the prospect music. For Bauhaus, it makes full use of the metal sound effect. For Song Zaju, I watched the figures on the exihibition and recorded a video, including sound, and could clearly hear the beating of musical instruments and the recitation of Moni’s poems.The instruments including bass drums, waist drums, plate drums, clappers, flutes, cymbals, qin, square sounds, pipa, panpipes, sheng, etc. Many ethnic minorities, as well as Chinese ancient instrumental performances. After watching this exhibiton, I am more interested in Song Zaju. 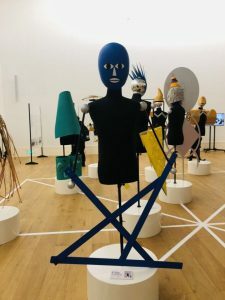 Whatever it is the costumes or masks od the figures in the exhibition. I will investigate different Chinese dramas, as well as theatres from different regions, and then my next teo collections will also be related to the drama. My final product is a magazine. 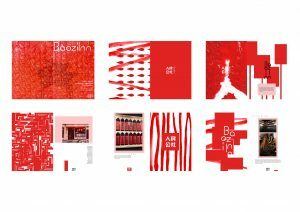 The theme is a Chinese restaurant named baozilnn, and a magazine expressed in abstract form and choose red as the main colour. Address in 26 Newpoet Court, London, WC2H 7JS. Before I made the magazine, I surveyed a lot about the decoration style in the old times of China. 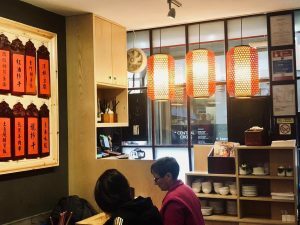 In old China, furniture was mainly made of wood, all kinds of wood carvings, all kinds of sun-dried cereals, plaques, red lanterns hanging high, etc. Baozilnn takes full advantage of these old Chinese decorations and is the most Chinese style restaurant in Chinatown. On the other hand is food, baozilnn is a Sichuan cuisine restaurant, so almost every dish is spicy. In each dish, a layer of red pepper oil sinks underneath. Skewers are the most popular and specialty dishes in this restaurant, and I like them very much. 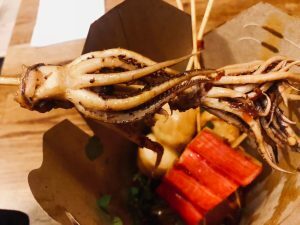 There are many kinds of skewers, such as Seafood, meatballs are very delicious. Also, I surveyed a lot of magazine layouts in books and online. In my works, I did it in abstract form. For example, skewers can be represented by lines plus squares, circles and other geometric patterns. I use some special materials and choose one typeface in my layouts. The whole magazine is divided into four parts: restaurant introduction, history, decoration and food. I hope to have different and more creative ideas for the next project. Start with the theme from a more meaningful perspective. 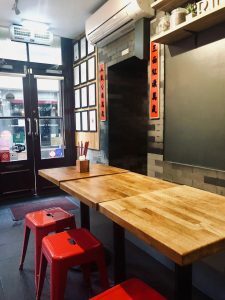 My postcode is Chinatown, and I found a chinese restaurant called Baozilnn, the chinese name is ‘Ren Ming Gong She.’ It is the only Sichuan cuisine in Chinatown, mainly spicy. After entering the store, I watched the decoration style of the restaurant, which was quite nostalgic. I saw two rows of wood carvings hanging on the wall. 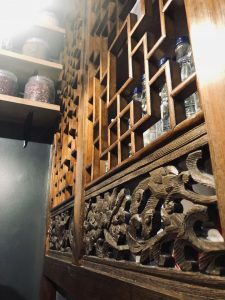 There were ancient wooden flower-dressing dividers in the restaurant, on which there were bottles and cans of Chinese grain and seasoning materials. Even the seating stool is thick wood, without the usual backrest. 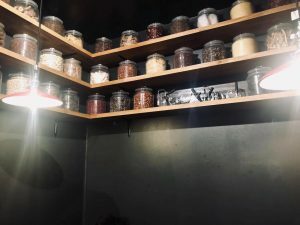 It feels like stepping into a small restaurant in rural Sichuan. So the first idea I am interested in the authentic decoration style of this restaurant. 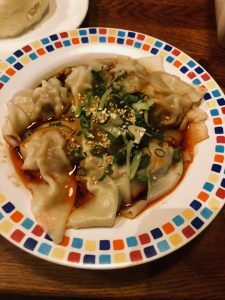 Then there is the delicious food in Baozilnn, all of which are my favorite spicy food. 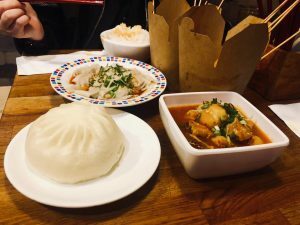 I ate a lot of things, such as steamed buns, wonton, skewers and chili chicken rice. The most popular food is skewers, and the meat is very tender and fragrant. I developed these two ideas and wanted to express them in an abstract way. For example, skewers can be represented by lines plus squares, circles and other geometric patterns.